What Are BioCell’s Purported Benefits? How Do You Take BioCell Collagen? Are Collagen Supplements Effective in Any Way? Does BioCell Collagen Make the Cut? BioCell Collagen is a proprietary ingredient added to supplements that allegedly boosts skin and joint health. It’s a blend of type II collagen, hyaluronic acid and chondroitin sulfate, which is supposed to work in synergy to deliver youthful skin. The makers cite several clinical studies that show BioCell Collagen is effective but more research may be needed. Branded as a natural way to make you look and feel better, BioCell Collagen promises a laundry list of benefits, including younger-looking skin, healthy joint function and the ability to reverse the signs of aging — all this delivered in a dietary supplement that you take twice a day. Sounds too good to be true? Ever the skeptics of any miracle cure-all, we thought we’d take a closer look at this new supplement to see if it lives up to the hype. BioCell Collagen is a collagen supplement that’s taken in the form of a capsule. Each capsule contains a mix of 70% type II collagen, 20% chondroitin sulfate and 10% hyaluronic acid. The primary ingredient — collagen — belongs to group of naturally occurring proteins that make up the body’s connective tissue. When the body stops or slows its production of collagen, which occurs naturally with age, this can lead to joint pain, fine lines, wrinkles as well as dry and sagging skin. In theory, replenishing the body’s collagen should lead to healthier skin and joints. Taking it a step further, BioCell Collagen claims that the hydrolyzed type II collagen in their product is more efficiently absorbed into the body than unhydrolyzed collagen. In addition, this supposedly “highly absorbable matrix” is composed of several other ingredients that promise significant advantages over other collagen supplements. One of these ingredients is hyaluronic acid (HA), which is regularly featured in skin-renewing products and treatments, including chemical peels. It is also often taken by people with certain joint disorders, including osteoarthritis. The remainder of the supplement is made up of chondroitin sulfate, which helps your body maintain healthy joint function – according to the manufacturer. At a glance, BioCell Collagen appears to take a comprehensive approach to improving overall health by supporting healthy connective tissue throughout the body. However, the brand’s promotional messaging primarily focuses on its purported benefits for the joints and skin. 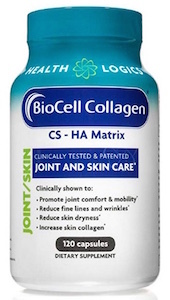 According to the company, BioCell Collagen helps improve joint function by strengthening its structure and cartilage. In fact, the brand says that its formula mirrors human articular cartilage. It’s also said to promote joint lubrication and replenish synovial fluid – which works within the joints to prevent inflammation and pain. The supplement may also be helpful to younger people and those with no joint pain as it claims that it can protect the tendons and ligaments from damage during intense exercise. We all know that collagen is required for beautiful skin, but can a supplement actually replenish the body’s own supply? In addition to combating dryness, wrinkles and fine lines, BioCell Collagen also claims to increase skin collagen type I, which occurs naturally in the skin and prevents signs of aging. It’s supposedly able to counteract effects from both natural and photoaging while enhancing blood microcirculation, which helps remove damage-causing waste from your facial tissues. You can purchase it as a standalone dietary enhancement, or take it within supplements made by other brands. For example, there are health drinks with BioCell Collagen in them, usually billed alongside other health-boosting ingredients. As a standalone supplement, the company recommends taking up to four capsules every day – two in the morning and two in the evening, depending on the specific dosage of the brand you choose. The company claims that the ingredients are safe for people of all ages. The capsules are non-GMO, gluten-free and contain no soy, shellfish, fish, eggs, peanuts or sugar. BioCell Collagen supplements cost between $20 and $50 USD for 120 capsules, depending on the formula and brand. BioCell Collagen has been tested in numerous human clinical trials – some likely funded by the manufacturer. Critics have called out the company for citing clinical trials that were not published online, and there has been some doubt shed on their legitimacy. The problem is further compounded as many of the studies lack valuable information, so it’s hard to tell whether they were performed following proper scientific protocol. With this disclaimer in mind, let’s take a look at some of the company’s data. In clinical studies cited by BioCell Collagen, researchers found that 89% of subjects experienced a degree of improved joint comfort. In another study, subjects experienced a reduction in fine lines and wrinkles, and an increase in skin hydration and collagen content. However, for the moment, there’s simply not enough peer-reviewed, independent evidence available to back up BioCell Collagen’s claims from a clinical perspective. Looking further afield to research on collagen itself could help us make some informed conclusions. As a good source of amino acids, which is a major component of joint cartilage, collagen supplements have been used to treat osteoarthritis and rheumatoid arthritis. After reviewing several studies, Arthritis Research UK concluded that the body of research on collagen itself does not show that it has any significant effect on reducing pain and joint inflammation. In essence, this result hasn’t been consistently reproduced across different trials. Research on the effect of collagen on the skin is somewhat more encouraging. In one study, participants who took 2.5 grams of hydrolyzed collagen per day experienced a 20% reduction in wrinkle depth around the eyes. Perhaps more promising is the fact that collagen supplements may actually have the power to elevate the body’s supply of “precollagen” by an impressive 65%. Some dermatologists are still skeptical of the actual impact any ingested pill can have on the skin’s naturally occurring matrix. Collagen also requires certain “tools” to work, and you can only get those in certain foods, says Seattle-based Registered Dietitian, Nutritionist and Arivale Coach Ginger Hultin. According to Hultin, there’s no need to buy collagen or purchase collagen-infused products to get the skin support you need. There is definite promise in BioCell Collagen but there needs to be more in-depth, unbiased research before we can back this particular product. Note that the supplement has not been evaluated by the U.S. FDA. Bearing this in mind, make sure you consult your health care practitioner beforehand if you decide to take this product on a regular basis.